I finally tried a cronut yay! And I didn't even have to wait in line for it! In case you didn't know, the cronut, a croissant/donut hybrid created by chef Dominique Ansel has been abit of pastry phenomenon ever since it's debut in 2013. A limited number are made daily and since the demand exceeds the supply there has been a complete frenzy with people lining up at the crack of dawn outside his New York City bakery since last summer just to try to get a taste of this sweet treat. So how did I get mine without queuing up? I used the online pre-order system. 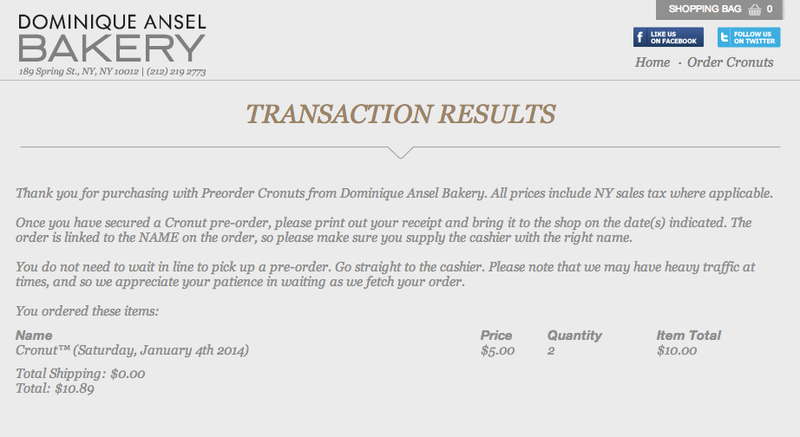 The Dominique Ansel Bakery launched this on their site back in November. It was apparently quite glitchy initially but they seemed to have the kinks worked out when I used it in mid-December. Due to high site traffic, I did have to keep refreshing the page but it did eventually load after about 20 minutes and I was presented with a list of available dates and quantities left. I selected a date, quantity and a pickup time which is in hourly slots. I was then directed to Paypal to make a payment and my order was confirmed. When pickup day came around, all I had to do was go the bakery at the time I selected and give my name and a copy of my confirmation email to the cashier in the front and she returned with my order. It was that easy. The pre-order site and phone system (212.219.2773) goes live at 11am EST sharp every single Monday and orders are accepted for 2 weeks out from that particular date. You can can pre-order up to 6 cronuts in a session subject to availability. Like I said, there is a high volume of traffic so you will have to keep refreshing the page. I didn't do it continuously... probably every few minutes. You will need to have a Paypal account set up to pay expeditiously as the cronuts are only held in your cart for 10 minutes. One drawback is that once you place the order, it cannot be changed or cancelled. But if you find you're not available to pick it up yourself, you can send someone in your place as long as they have your name and confirmation info. Also if you're placing a pre-order for the following month, it means you may not know what flavor you will be getting since a new one is introduced monthly but that's probably an acceptable risk for most. Obviously this will work best if you live in New York but it's also good if you know you'll be visiting the city. 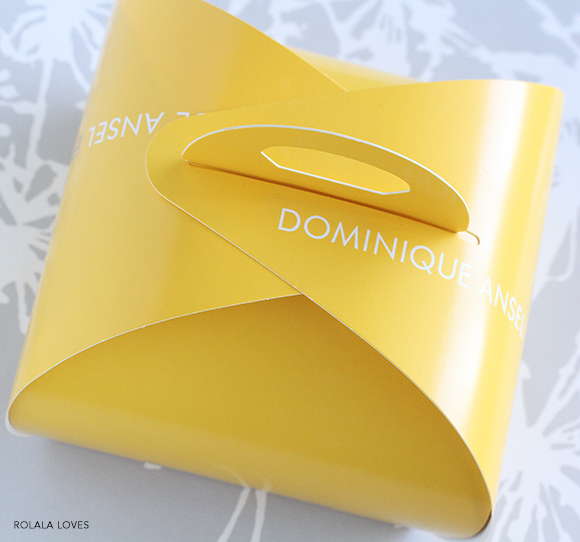 To learn more, you can visit the bakery's Cronut 101 page. Onto my review of the actual cronut. The flavor for January is Peanut Butter Rum Caramel. It really has the nice crispy exterior of a donut and inside are chewy flaky layers just like a croissant. The taste was pleasant and hubster and I both enjoyed it despite not being big fans of peanut butter or caramel. I will say that the peanut butter which is made at the bakery is quite good and has a lovely creaminess. I personally thought it was a tad sweet and could've used a little less sugar coating on the outside because the rum caramel cream inside was already quite sweet but then I rarely eat sugar so I tend to be a little sensitive to it. Hubster felt the sweetness level was fine. While there is lightness to the pastry layers, there is a richness to the layers of peanut butter and rum caramel cream which ooze out when you bite into it. It's definitely an experience and I liked it enough that I would try it again. I'd probably use this same pre-order method again as I find it preferable to waiting on a physical line for hours. I was just reading about what could be the next hybrid sensation, the cragel, a croissant/bagel offered by the The Bagel Store in Brooklyn, NY. It's $2.95 which makes it $2.05 less than the cronut and significant lines haven't formed for this one yet. It's also available for order online. Since I prefer savory treats, I may have to try this. 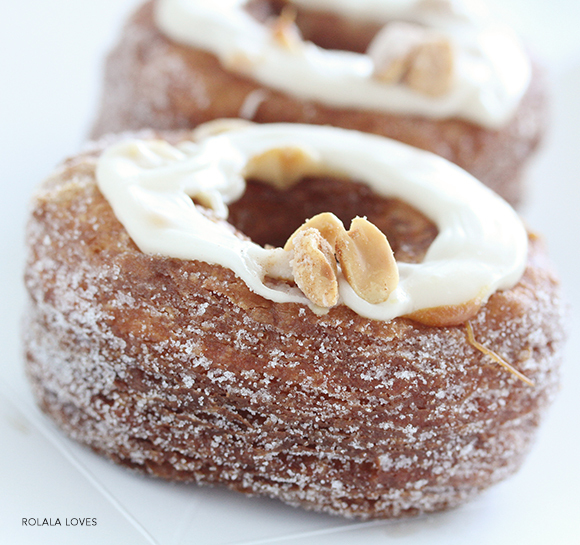 Have your tried a cronut? Would you wait on line for a pastry or any type of food? How long would you be willing to wait? I've heard of these but I don't know if I would go out of my way for a peanut butter rum caramel one. Maybe a peanut butter and chocolate one but I'd probably only be patient for 10 minutes ;) I'm glad you were able to try one and you liked it though!! They are addicting I love them and cannot believe how this concept came about mixing both of my favorites things to eat but they did and I love it. Glad you try it and love it to. Have an awesome weekend doll. Sounds like the best of both world - croissant and donut, Rowena. I heard about it but haven't seen what it looks like. It looks delish. Up to this date, I still haven't tried macaron either. Have a good weekend. Oh wow I had no idea you could do this! Very cool, maybe one of these days I will have one. I need to email you about your husband experienced with his problematic RC. I have to see an oral surgeon that specializes in nerve damage and possibly a neurologist. This doctor was recommended by a lawyer I spoke with. OMG - what?!? Mind blown!! I need to try this! I also need to tell all my co-workers - we're gonna have a cronut party! And there's a cragel?! Whoa. The pre-order system is very clever. Can you believe I've never eaten a cronut? Is that weird? I want one now though. I have read so much about these and I really can't wait to try one but I just haven't come across one yet. It looks absolutely divine and perfect for my sweet tooth! So, I was in line 2 hours plus before the store open, 6:30am, I think but it was summer and landed at 5am JFK, it's not like I really have to get up early for it. It was really good but since I don't have sweet sweet tooth and neither croissant & donuts are my pastry of choice, I would eat this if offer again but won't go through troubles just to have it (: It look gorgeous yummy in the photo and probably is not a good idea looking at it at 2am in the morning!! Oh my...that looks absolutely delectable. 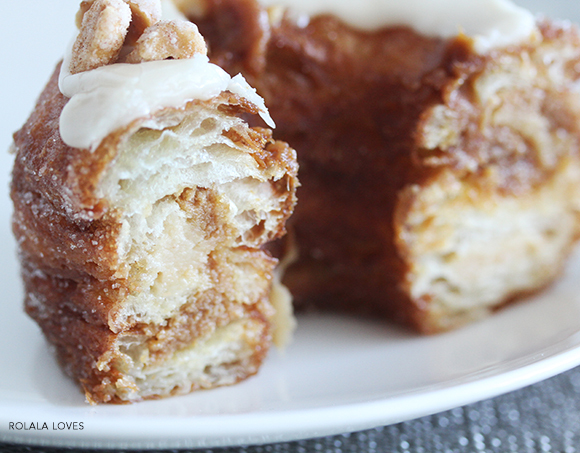 That crispy, sugared, golden-brown exterior...the fluffy, flaky interior...Yes, please! Never heard of the cragel, though, and I'm not a fan of bagels in the first place. They're just too dense. But I can see why people are lining up for cronuts. Great idea Rowena..... I have never heard of these! om nom nom, that must me delicious! This is a very good information! I've been wanting to try it but couldn't fathom lining up like that! uuhhmm it looks so yummy! I saw the post of this title and thought you must have either bribed someone or made it yourself. How did I not know about this pre-ordering system!? I have been dying to try a cronut, but I'm all the way in LA & I refuse to try a knock-off. I want one straight from the bakery in NYC! thank you so much for stopping by my blog! the famous cronut, I don't think I would stand in line for one but they look pretty good! Looking forward to following your blog! Have a FAB weekend!! What a treat to not have to line up for Cronuts! I haven't had many crazy queues lining up for the Australian version. A Cragel however, now this I've got to try. rowena, thank you for explaining what a cronut is! i did not know. i've been hearing about them, but never saw one. thanks for the pictures too. it is absolutely amazing that you have to pre-order these! their popularity must be through the roof. so glad you like them and want more. that says a lot! i would do the exact same thing. so they have flavors of the month! that is interesting. excellent review doll! I've heard about these! Haven't had one myself yet though, but it sounds and looks absolutely deliciousssss! They're mighty expensive aren't they, $5 sheesh! Always worth a go though, it's not like you'd buy them regularly. Well it looks like you couldn't anyway. A Cragel, ace, let's see this next! I'm so glad that they have that online ordering system! I've been wanting to try it, but couldn't justify waiting in line for two hours, haha. Now that I can preorder, I'm pretty excited that there's a chance I can eat one now! I've never heard of this, it looks really delicious! Hey thanks for the lovely tip. I'm definitely going to try this out one day. I hate to stand on any line. Looks like pure heaven, that does! I wish I lived in NYC, what a great idea though, to order online! I bet people were jealous! haha! It looks so yummy never tried one before, but they even sell them in Munich now haha cronuts are all over the world now! which I think would be so awesome. This is so interesting, never knew about that before. I have only heard of the cronut before but this is the first time I am actually seeing one. I would be really interesting to taste it and see what type of texture it is. Lucky you for not having to wait in line! I am always grateful for your kind comments...Have a great week ahead! OMG these look amazing! My mission will be to try and locate one in Melbourne! AHHH!! You got a cronut!!! I'm seriously so jealous! My coworkers and I were talking about these months ago and how we really wanted to try one. I love peanut butter and caramel, so that sounds perfect to me. It looks absolutely amazing. And oh my gosh, a cragel! haha, that is too funny. Sounds pretty amazing to me though! That looks amazing!!! I had Stu bring me a cronut to the hospital the day after Alex was born!! It was sinfuly delicious! !